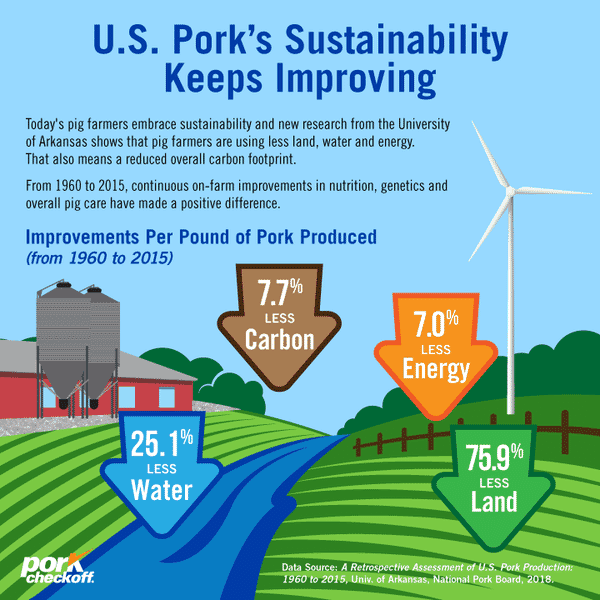 According to the new study, A Retrospective Assessment of U.S. Pork Production: 1960 to 2015, the inputs needed to produce a pound of pork in the United States became more environmentally friendly over time. Specifically, 75.9 percent less land was needed, 25.1 percent less water and 7.0 percent less energy. This also resulted in a 7.7 percent smaller carbon footprint. Because feedstuffs make up the biggest part of pork’s sustainability footprint, the National Pork Board recently signed a memorandum of understanding on improving sustainability with the United Soybean Board and the National Corn Growers Association. The three organisations will cooperate to conduct research directly related to the environmental sustainability indicators of carbon (greenhouse gases), water use, land use, water quality and soil health.